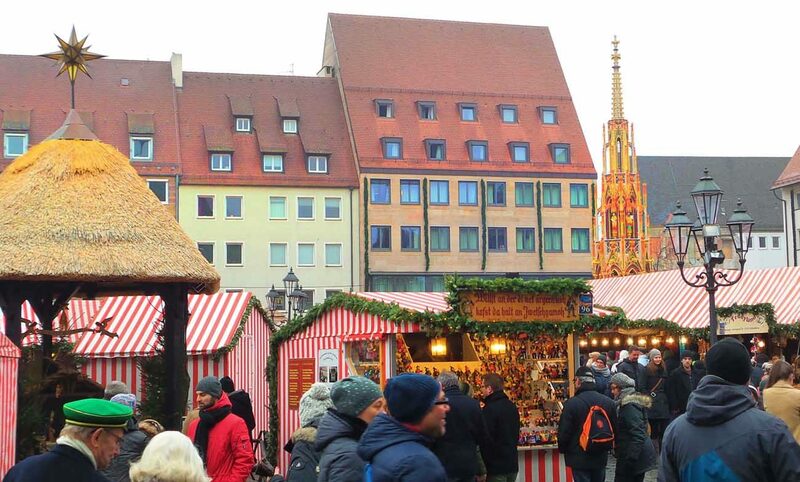 NUREMBERG, Germany (CNS) — At a time when many people are celebrating Christmas with material gain, the people of Nuremberg continue a 68-year-old tradition of sharing Christmas spirit through community service. Every year since 1948, the “Christkind,” or Christ child angel, appears standing on a parapet of the Frauenkirche, the Church of Our Lady, in the old medieval citadel of Nuremberg. Dressed in a shimmering cloak and flowing white gown, she is instantly recognizable due to her long blond curls and tall golden crown. She is Nuremberg’s embodiment of a female angel, said to bring Christmas gifts to people in German-speaking countries. “My duty as the Christkind is to bring Christmas and Christmas joy to people,” said 19-year-old Barbara Otto, the current Christkind, elected in 2015. Every two years the city of Nuremberg elects a young woman to play the role. She must be sociable enough to preside over one of the oldest Christmas markets in Germany, wise enough to explain the intricate details of Germany’s former imperial city, and tall enough to stand on the towering ledge of a church designed in 1355 to house the Holy Roman emperor’s scepter and crown jewels. Yet, despite her prestigious position, the Christkind’s duties are humble. She spends most of her time walking along busy streets, visiting people at the local Christmas markets or at charitable institutions such as hospitals and homes for the elderly and disabled. “Last year I was at the street clinic in Nuremberg where homeless people are cared for,” Otto recalled in a November interview with the Archdiocese of Bamberg. After reciting a traditional poem and distributing gifts, she was surprised by the sound of music and an invitation to dance with everyone. This year, Otto, a native of Nuremberg, estimated she had 180-190 appointments scheduled at local organizations within the city and neighboring communities. The city of Nuremberg prohibits her appearances for commercial use; she works only to promote charitable causes, including friendly relationships with people of other countries. One of her tasks is to distribute gifts to patients at various children’s hospitals. The Christkind angel, often mistaken for the Child Jesus, was created by Martin Luther to counteract Catholic devotion to St. Nicholas. However, the angel tradition found common ground between Catholics and Protestants and quickly spread through both religious communities across German-speaking territories. “The Christkind is a unique character, that can bring people joy only through her behavior,” Otto said in an interview with the city of Nuremberg. A music enthusiast, volunteer, and student of business, Otto is proud to be responsible for the demanding role of representing her home city. “Only 23 other women in Nuremberg before me have accomplished this,” said Otto. Like her predecessors, Otto will continue to remain on active duty after her last term presiding over the Christmas season ends in Germany. She will then act as ambassador to sister Christmas markets in Philadelphia and Baltimore and will visit Glasgow, Scotland, Nuremberg’s sister city.